Simlipal National Park derives its name from the abundance of semul (red silk cotton trees) that bloom here. his reserve is part of the UNESCO World Network of Biosphere Reserves since 2009. Kuldiha Wildlife Sanctuary (272.75 km2). The park covers an area of 845.70 square kilometres (326.53 sq mi) and has some beautiful waterfalls like Joranda and Barehipani. Day visitors can enter between 6 AM and 12 noon and visitors with reservation between 6 AM and 9 AM. Simlipal is home to 99 royal bengal tigers and 432 wild elephants. Besides Simlipal is famous for gaurs (Indian bison), chausingha, as well as an orchidarium. Simlipal national park or elephant reserve originated mainly as a hunting ground for the royalty. It was formally designated a tiger reserve in 1956 and under Project Tiger in May 1973. “Mugger Crocodile Scheme” was started in 1979 at Ramatirtha, Jasipur. The Government of Odisha declared Simlipal as a wildlife sanctuary in 1979 with an area of 2,200 square kilometres (850 sq mi). Later in 1980, the state government proposed 303 square kilometres (117 sq mi) of the sanctuary as a national park. Further in 1986, area of the national park was increased to 845.70 square kilometres (326.53 sq mi). Government of India declared Simlipal as a biosphere reserve in 1994. UNESCO added this national park to its list of Biosphere Reserves in May 2009. There are 10,000 people living in 61 villages in the forest. That is why Simlipal is yet to be declared a full-fledged park, despite its having the status of one of the 18 biospheres of India. The park is a treasure house of 1076 species of plants belonging to 102 families. 96 species of orchids have been identified here. It lies in the Eastern Highlands moist deciduous forests ecoregion, with topical moist broadleaf forest and tropical moist deciduous forest with dry deciduous hill forest and high level Sal Forest. The grasslands and the savannas provide grazing grounds for the herbivores and hiding place to the carnivores. The forest boasts of innumerable medicinal and aromatic plants, which provide a source of earnings for the tribal people. A total of 42 species of mammals, 242 species of birds and 30 species of reptiles have been recorded in Simlipal National Park. The major mammals include tiger, leopard, Asian Elephant, Sambar, barking deer, gaur, jungle cat, wild boar, giant squirrel and common langur. 231 species of birds nest in these forests. The park has a sizeable population of reptiles, which includes snakes and turtles. The "Mugger Crocodile Management Programme" has helped the Mugger Crocodile to survive and flourish on the banks of Khairi river. Best season to visit the park is from October to June. 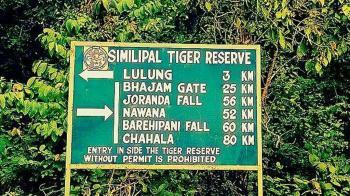 Similipal National Park is open from 1 October to 15 June. Temperature ranges between 22°C to 40°C during Summer. By Air - The nearest International Airport is Netaji Subhash Chandra Bose International Airport, roughly five hour drive from Simlipal. By Rail - The nearest Railway Station is Balasore Railway Station which is located at a distance of 76 Kms from Simlipal. By Road - Tourist can visit the national park through their vehicles as NH-5 and NH-6 is well connected to the Park. Regular bus service is also available.